Thinking of picking up a new hobby, a new skill or language? Are you hesitating because you are now more mature in life? Worried about being an “old dog” learning new tricks? Don’t be discouraged! Learning is a life-long journey and we should continue regardless of our age. 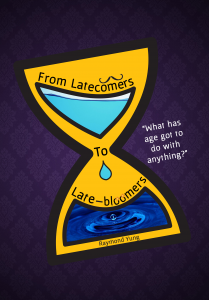 From Latecomers to Late-bloomers – What has age got to do with anything? is a guidebook for anyone who wants to learn a new skill, but who is concerned that being more mature makes learning difficult. It provides psychology, tips and exercises that will make learning a fun and exciting experience, no matter where in life you find yourself. See From Latecomers to Late-bloomers on Lulu or Amazon.co.uk or click a link below to order your copy. For countries outside of the UK, Amazon stock From Latecomers to Late-bloomers on their international sites. Please click one of the following links to purchase either the printed edition or the ebook. Availability may vary by region. For countries where Amazon has no local distribution, please click the US link.